The sheer number of businesses and industrial properties located—or once located—in the Twin Ports is extraordinary, particularly when you consider the logistics of shipping and receiving raw materials and finished goods. Many of these facilities were served by railroad tracks installed either alongside or inside of buildings for loading and unloading. The largest businesses in the region could handle well over 1,000 rail cars each month. Typically these were the coal, grain, iron ore and taconite docks that operated on a grand scale compared to everything else. Mid-range businesses handled dozens to hundreds of cars per month. 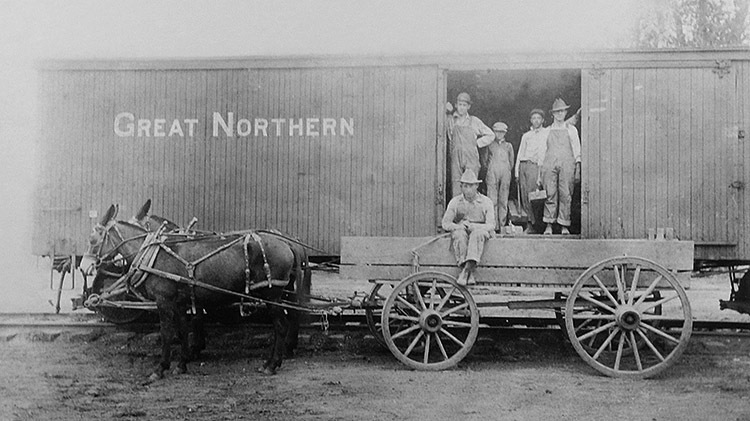 The smallest companies handled perhaps ten cars or less, but they also required the most creative solutions to connect to the rail system: team tracks. In the strictest definition of the phrase, a team track is a small railroad siding or spur track intended for the use of area merchants, manufacturers, farmers and other small businesses that personally (or through hire of draymen contractors) load and unload products and merchandise, usually in smaller or less-than-carload quantities. Any number of businesses could use the same team track. With the exception of hazardous materials, most any team track could be used to load or unload any imaginable good, product, raw material or equipment. The team track is in effect the rail siding that companies use when they don’t have their own rail siding. Many of these team tracks were just a single track with public road access on one side or the other. Others were larger with property big enough to support loading conveyors or unloading equipment. Some had concrete pads or end-of-track ramps to make it easy to move drive-on-drive-off loads too. During what many consider the local railroad industry’s modern consolidation era—1967 through 1979 when area businesses and railroads alike were merging—a total of 500 different companies used the railroads to move goods in and out of Duluth-Superior, 343 businesses on the Duluth side of the harbor and 157 on the Superior side. Of that, 67 (roughly 13 percent) of these “railroad-served” businesses—had to use team tracks. Thanks to the over-the-road trucking boom of the 1960s, many smaller companies completely eliminated railroads from their transportation plans. Some hung on and took advantage of trailer-on-flat-car (TOFC) loading, which loads semi-truck trailers onto railroad flat cars at team tracks equipped with the proper loading ramps. Every railroad in the Twin Ports had such a ramp at one time; some had more than one. But TOFC didn’t stave off an overall declining need for team tracks. With the consolidation of so many smaller businesses during the last few decades the need for team tracks certainly declined—but they didn’t disappear entirely. Today, the most modern of all team tracks in Duluth-Superior loads and unloads all sorts of special cargo. Since its opening in 1959, the Clure Public Marine Terminal has provided ample space for any business to transfer loads of any kind between marine vessels, railroad cars, or trucks. This includes four tracks with direct access to the BNSF, CP, CN and UP railroads as well as 360,000 square feet of warehouse space. Team tracks have come a long way since the days of horse drawn wagons but the basic principle is still the same. There’s always going to be a need to get goods and merchandise from its point of manufacture onto railroad cars. And for companies without rail access, the team track will remain a big part of their transportation plan.